This weekend, our comrades at the University of Minnesota have organized a remarkable conference. 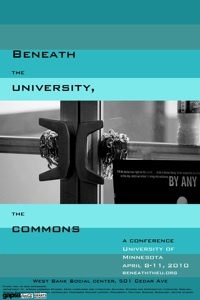 “Beneath the University, the Commons” is the third in a series of annual conferences bringing together theorists and activists from universities around the world to discuss our struggles against the neoliberal privatization of the university. “The Weight of Past Generations II”: Brian Malone, Kate Woolsey and Madeline McDonald Lane from UCSC. Also, if you are interested in hearing about March 4 at the University of Washington, as well as their potential upcoming TA strike, you will want to watch Cindy Gorn’s presentation on this panel. You can watch the conference live stream here. Check out the conference homepage here. On behalf of all of my UCSC comrades, I would like to thank the U of M organizers for an amazing weekend!